Over a decade ago, the young designers of Legend of Zelda were staring down a massive problem. Ordinarily, they’d have considered themselves to be in an enviable situation. They were creating the first Zelda game in polygonal 3-D, working closely with the legendary Shigeru Miyamoto. And Koji Kondo, the composer of the ubiquitous Super Mario Bros. theme song, was writing the music. In fact, he’d just delivered the music to be used in the game’s final showdown against Ganon. And it really didn’t work. The designers were terrified. Which of them was going to call Koji freaking Kondo and tell him, hey, thanks for the music, but we need something different? So they asked the game’s co-director Eiji Aonuma to do it. “We had a lot of struggles in deciding what that final boss battle was going to be,” Aonuma recalled in a joint phone interview with Kondo to Wired.com on Friday. 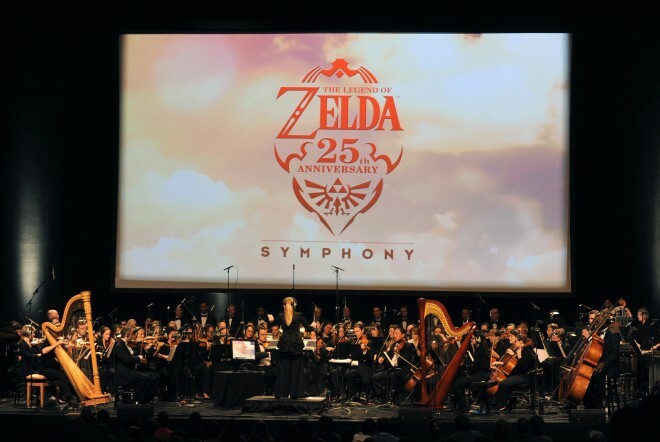 Kondo and Aonuma, now the producer of the Zelda series, were in Los Angeles last week for the U.S. premiere of an orchestrated concert of music from the last 25 years of Legend of Zelda videogames. Nintendo also held Zelda concerts this month in Tokyo and London, and a wider tour will kick off next year. “The original song was more dynamic and somewhat harsh,” recalled Kondo. “Yes, it was,” said Aonuma. “So I called Kondo-san and I said, I’m sorry, this wasn’t quite the song we were looking for, could you do something else?” The team wanted something that reflected what they hoped would be a sense of incredulity in the player: Oh my God, I still have to fight this guy? The Mario maestro had never been precious about his work. He’d gone through several versions of that classic Mario tune, rejecting them if they didn’t perfectly accentuate the game’s action. So he had no qualms about scrapping his work and trying again. A CD of the concert tour’s orchestrated tunes, representing 25 years of Kondo and company’s best work, will be included with the first run of copies of the Wii game The Legend of Zelda: Skyward Sword , which Nintendo will release Nov. 20. It is the first game in the series to use music recorded by an orchestra. This is hardly a novel concept; in fact, Nintendo has long lagged behind its peers in using live recordings versus synthesized tunes. Last year, it finally decided to try orchestrated recordings in Super Mario Galaxy 2 . “We wanted to express the vastness of space musically, and one of the ways we did that was through the grandness of a full orchestra,” Kondo said. We wanted to express the vastness of space, musically. Aonuma says the final decision was made by Miyamoto after this year’s E3 press conference, which began with a short orchestral performance. Nintendo’s former reluctance to use live orchestrated recordings wasn’t because the company was full of Luddites. Primarily, it was because it prefers to have the game’s music to be programmable, and to react in a dynamic way to what the player is doing. The song you hear when exploring the vast overworld in Ocarina of Time is actually several different chunks of music that are strung together randomly, to keep it from becoming repetitive. When enemies approach, the music slowly metamorphoses from bouncy to dramatic. One method was to have the conductor listen to a tempo on a click track so that the timing would be consistent and the music could be layered together. They’ve also woven in some traditional computer-generated music in scenes where dynamism is called for. To preserve the ability of Kondo and the game designers to tweak the game music at the last minute, Nintendo also bumped the recording back to much later in the game design process, “when we don’t anticipate much in the way of changes,” Kondo added. 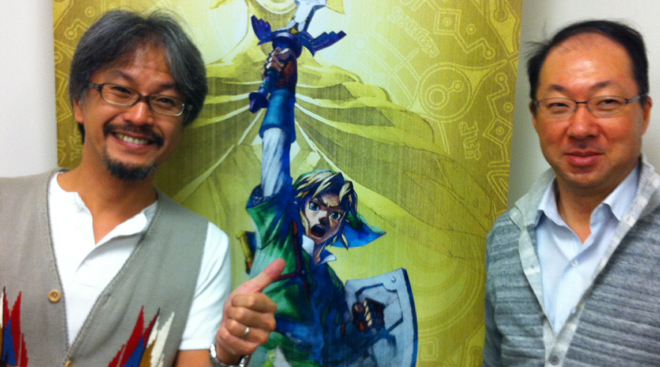 Skyward Sword , Aonuma said, has had a longer development time than any Nintendo project he can ever think of. The last game, Twilight Princess , was launched simultaneously with Wii in 2006.